Of the three films released in Arrow Video’s American Horror Project, The Premonition is not, strictly speaking, the “best” of the bunch. It is, however, quite emblematic of the warts-and-all, without-a-safety net filmmaking highlighted by the collection, which has quickly become one of my favorite releases in recent years. Eccentric, makeshift, surreal, and oddly mean-spirited, this Mississippi production resembles collected fragments of both childhood and parental nightmares that have been crudely reassembled to capture the distant echoes of a half-remembered but unshakeable trauma. Like The Witch Who Came from the Sea and Malatesta’s Carnival of Blood, it’s a film that approximates what it must be like to peer into the tumultuous subconscious of a fractured psyche. In this case, audiences glimpse into the lives of Andrea and Jude (Ellen Barber & Richard Lynch), a couple of carnival workers who apparently spend their time scouring a local amusement park’s crowds, scanning for one child in particular. Details or explanations are scarce—it seems appropriate that the film opens on Jude’s ominous mime routine, perhaps foreshadowing the film’s initial reluctance to illuminate its opaque plot. Judging from their conversations, this couple has long searched for Janie, the young girl who finally appears in the carnival photos, and Andrea is so anxious that she visits the local school the next day, much to the alarm of the girl’s mother, Sheri (Sharon Bennett). As these two women suddenly find themselves in each other’s orbits, repressed secrets from the past begin to rumble to the forefront, aided by preternatural visions that hint at a bleak future. This isn’t even the half of it: The Premonition is a film that zigs and zags, though it hardly does so in a playful manner. Rather, it spirals ominously, as if bent toward some fatalistic doom. Dusk seems to have permanently settled over and around these characters, enwrapping them in a languid, hypnotic rhythm. Despite its very realistic—and grim—subject matter, the film seems to unfold under a foggy, supernatural haze that’s deceptively drowsy. The Premonition is a film that seems to purposely lull you into a weird sense of inevitable anxiety: you watch as Andrea stages a home invasion in an effort to kidnap the young girl, convinced that something awful is about to unfold even when Sheri awakens in time to intervene. And then it hits: in the middle of the scuffle between the two women, Janie’s pet turtle is smashed, reduced to a startling puddle of viscera. The camera starkly captures this gruesome, disturbing image, which functions as a genuine, mean-spirited jolt: I’d say it’s akin to someone shaking you from your sleep, awakening you from a nightmare, but The Premonition only plunges further into its dreamy surrealism from this point forward. Andrea’s psychotic break with reality becomes more pronounced, while Sheri is suddenly plagued by lucid visions of the other woman, who becomes a haunting presence, like a specter looming over her, threatening to steal her daughter. The violence, too, becomes more pronounced, particularly once Andrea and Jude’s motives begin to diverge. The Premonition is a slippery movie, one that toys with the audience’s perception of its characters by withholding information. Given its cryptic setup, it’s hardly surprising that it stumbles a bit once the script begins spilling secrets through clumsy expository sequences and a subplot involving Sheri’s husband, a doctor whose work with hypnosis feels totally ancillary until the film’s various threads slowly converge. It also comes as little surprise that the coarse narrative and relative lack of coherency really matters since The Premonition vaguely echoes Eurohorror trappings with its sleepy atmosphere and subliminal bursts, allowing the ominous vibe to trump the fractured logic. Who needs a straightforward story when you have a painting that inexplicably bleeds tears? Just as the other two films from the American Horror Project crossbred this Euro-tinged atmosphere with grimy, regional filmmaking, so too does The Premonition. Days after you watch it, the film rattles around in your brain, lingering like the remnants of a repressed (or wholly imagined) childhood vacation to the middle of nowhere. Director Robert Schnitzer burrows deep into the hole-in-the-wall setting, taking viewers to run-down homes on the edge of town and secluded abodes nestled deep into the woods. The Premonition feels as if it could take place in any sleepy town, but this cozy sense of Americana is warped into a smothering, foreboding doom. Emerging from this fever-dream miasma are Andrea and Jude, a couple of damaged individuals who seem to have crashed into each other by circumstance. Lynch is expectedly creepy as the latter, a no-good con-man whose amusement park mime routine sharply contrasts with his intentions, which grow more sinister and violent as the film unfolds. What looked to be a two-person child-snatching operation is revealed to be something more complicated once Andrea’s motivations become clear: Janie is the daughter she was forced to give up for adoption, marking her as a complex, almost tragic figure here. During the course of The Premonition, she shifts from boogeyman to a ghostly figure to guide the other characters through a turn of events that anticipates Audrey Rose’s new age mysticism. The Premonition takes a bit of hard turn in this respect, but the climax is no less murky and hazy. This is a film that doesn’t really want its audience to emerge from its foggy dream logic even as it hints at a hopeful conclusion. It may end with reconciliation, yet there’s a sense that we’ve just watched two women endure a hellish experience that will never leave them. Here, The Premonition is especially a kin to the feminism on display in The Witch Who Came from the Sea, albeit without a prominent violent streak. Andrea and Sheri are pitted against each other as adversaries, as the former misguidedly displaces her own abuse onto the latter before finally directing her scorn towards the truly deserving targets. She’s half-wrath, half-guardian angel, the cagey center on an equally elusive film. In some ways, The Premonition further bridges the gap on the American Horror Project with its carnival setting, which recalls the hallucinatory trappings of Malatesta’s Carnival of Blood. Both films undercut nostalgia by twisting the stuff of childhood dreams into absolute nightmares. When I was a young child, my parents took me to a local, backwoods amusement park that’s creepier than it is exciting, and my mind has never quite shaken that incongruent sense of dread. These two films especially recapture that feeling, while The Witch Who Came from the Sea is similarly perched from a childlike, fairy tale perspective, resulting in a perhaps unexpected sense of unity for this collection. Having seen all three, they feel less like shattered, regional fragments shored against ruins and more a cohesive collection of lo-fi phantasmagoria. Like the other two films in the collection, The Premonition boasts an introduction from Stephen Thrower, plus a twenty-minute retrospective featuring various cast and crew members. Schlitzer is also present for a feature-length commentary, plus an archival interview; Lynch, too, is featured in a separate interview, while three of Schlitzer’s short films provide a further glimpse at a talent who would only be credited with one more feature (and a decade later, at that). A trailer and TV spots for The Premonition complete the disc, rounding out an impressive collection of titles that could have easily been ignored, forever relegated to an obscure heap. My thoughts can’t help but turn towards a potential second volume from Arrow: certainly, the “Volume One” moniker here hints at a follow-up, and there’s no shortage of similar titles that could appear if Arrow makes this a series. This regional filmmaking scene is arguably the most fertile ground imaginable for reappraisal. Dare we dream that Arrow may dust off some more obscure titles from this era? I would specifically wonder if this might be an opportunity to see a restored release of The Legend of Boggy Creek, but it might not be obscure enough for this kind of set, which speaks volumes about the deep cuts Arrow has procured here. Here’s hoping they’re not tempted to go a more accessible route in the future—I want more oddities and oblique offerings, even if they’re not masterworks. 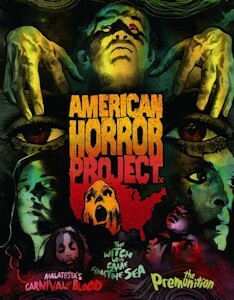 If anything, the warts-and-all sensibility of the American Horror Project is what defines it: these are not perfect films, but rather idiosyncratic dispatches from a distant era that demands further chronicling.